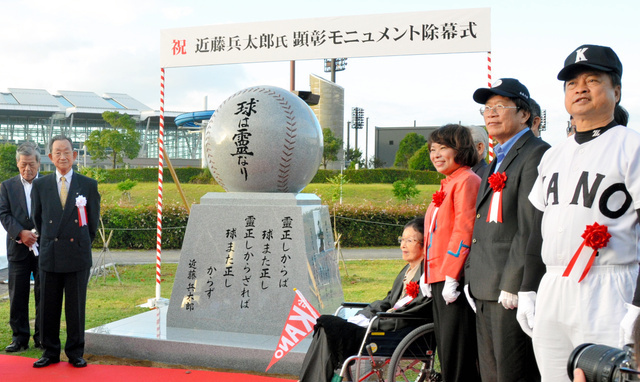 Matsuyama City, Japan: 120 people attended the dedication of a memorial to Hyotaro Kondo (1888-1966) who led the former Kagi Norin Junior High School in southern Taiwan, which became the current National Chiayi University, to the inspirational runner-up finish at the prestigious summer Koshien baseball tournament in 1931, when Taiwan was a colony of Japan. The event also served as a prepublicity of a new Taiwanese film “KANO” that recounts the amazing feat of the former Kagi Norin school in 1931, to be released in Japan in January, 2015. Governor of Ehime Prefecture, Tokihiro Nakamura, Mayor Huang, Ming-Hui from Chiayi City, and alumni in their original ball clubs’ jerseys from Chiayi as well as Ehime honored the memory of the dashing Coach Kondo.